The 13 x 13 comes with 4 windows, two on each side. The 13 x 16 and the 13 x 20 come with 6 windows, 3 on each side. Each window is screened and reinforced. Windows velcro down on the sides and bottom to seal the window up when not in use. Windows can be rolled up and tied open. All of our canvas tents come with a stove jack and cover in the roof in the front right corner. The stove jack comes with a 4, 5, and 6 inch circle sewn into it. This allows you to cut out your stove opening once you know what size of stove you will be using. Our walls come with an extra 6 inches of material on the bottom to create a sod cloth. This helps seal up the bottom of the tent. There are ties on the inside of the tent that allow you to secure the canvas to the poles. This helps keep the frame in place and reduce the fabric from flapping in the wind. Openings on both sides of the tent that Velcro close and can be opened and closed by a pull string. The roof extends beyond the walls creating a eves to help prevent water from running down the walls. Anywhere the tent comes in contact with the poles there is at least two layers of canvas. The four main corners vecro and tie shut. The velcro corners help eliminate the issue of the corners ripping while taking the tent on and off the frame. 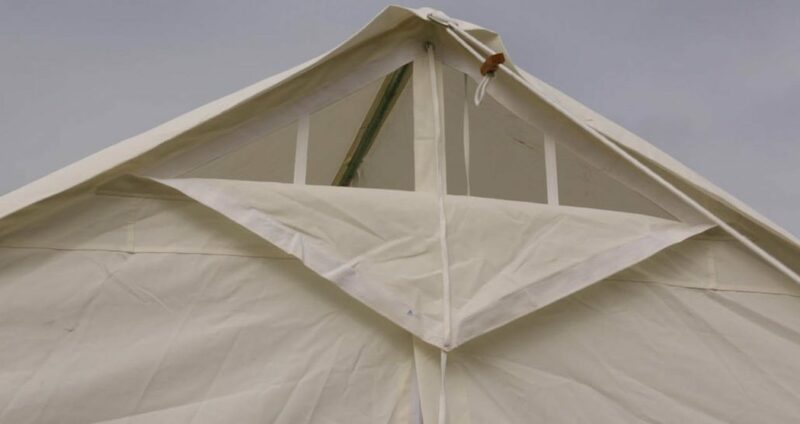 Your canvas tent will come with all of the angle pieces to make your complete frame. Angle pieces are zink coated to help prevent corrosion. Angles are made for 3/4″ EMT conduit. You can upgrade to the premium angles if you want to use 1″ EMT. Science has improved the types and quality of material available these days. We believe in using the best materials to make you the highest quality canvas tent possible. Unlike other polyester-based tents, we do not have condensation issues. Our unique polyester tent material is an 11 oz canvas with a breaking strength of 449 lbs (warp direction) and 382 lbs (fill direction), making it significantly tougher than traditional canvas which has a breaking strength of 382 (warp) and 241 (fill) for 12 oz canvas and about 210 (warp) and 140 (fill) for 10 oz canvas. The tear strength is 67 lbs (warp) and 40 lbs (fill); this is roughly double that of the Sunforger canvas material used by other tent companies. 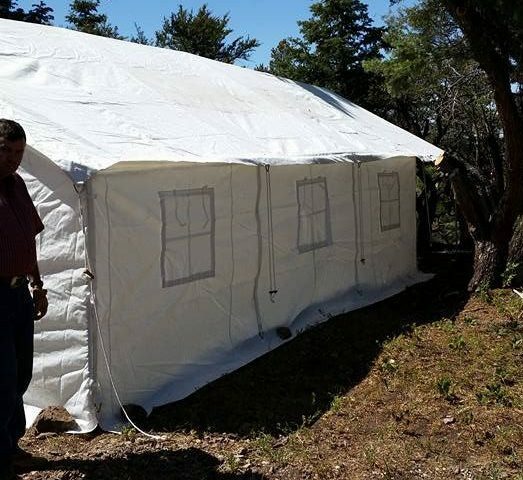 With over 25 years hunting experience in the backcountry, our mission was to design a wall tent with a high quality material at a reasonable price. We wanted something better. The material we use is superior to traditional canvas. Made from a waterproof fabric and sealed seams.